To continue our bonsai hobby during the winter months when our outdoor bonsai are tucked away and for those that live in apartments where they cannot practice the art of bonsai with outside plants, the use of tropicals as bonsai is growing in popularity. As has been stated, tropicals are outdoor plants in their native locals but they cannot be allowed exposure to temperatures below 50 degrees. They then must be brought indoors and given a warm place until spring. For those that must keep them indoors all year round they also provide them with the bonsai experience. The biggest problem facing the keeping of tropicals is adequate lighting. A bright window is fine, but it should not have the hot afternoon sun beating down on the plant. Glass has a way of magnifying the rays of the sun and scorching the plant. A North or East window where you get morning sun is perhaps best. Many tropical bonsai are grown indoors under artificial light and this is probably the most successful method. Any type of grow light bulbs will suffice. The second problem is humidity. Most homes today are much too hot and dry for the growing of plants. I grow mine on humidity trays and mist them regularly. Humidity trays that incorporate a grille over a water reservoir may be purchased or you may utilize pebbles in a tray to keep the pots above the water level. They may even be decorative stones to add to your display. John Naka says, “ tropicals are not only a special plant requiring special care, it is more like a pet, and a little time each day should be spent in it’s care”. Each month we will explore the various tropical species used in bonsai and their requirements and care. The most loved tropical bonsai is Ficus (fig). They are an excellent plant for beginners. 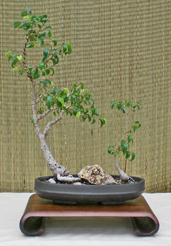 Ficus are fast growers, tolerant of most any soil and light conditions and perhaps most importantly, are remarkably forgiving of those just learning bonsai watering techniques. Most Ficus will grow in low light, but thrive in high light conditions. They require temperatures above 50 degrees. They should be fed in accordance with their growth activity. Weekly during the summer months and monthly during the winter. Most Ficus should be repotted in spring every 2 to 3 years. Roots can be easily pruned by half. Top pruning can be carried out anytime it is required. Ficus will bleed a milky latex profusely when cut but when it dries it forms it’s own natural seal. No cut paste is required. One of the best trees for beginners. Inexpensive, readily available, able to be transplanted any time of the year, grows in low light, tolerant of erratic watering and develops spectacular banyan (aerial) roots. A dwarf cultivar ‘Too Little’ is available, but not as easily or cheaply. This is the renown Banyan Tree. A very robust tree that does well both indoors and out. Can tolerate low light, but grows more strongly with high light. Grows extensive aerial roots. A very low maintenance tree. Tolerates low light and dry soil. Most Ficus produce an inconspicuous flower and an inedible fruit. They are relatively free of pests and scale seems to be the biggest. Healthy plants may be defoliated in June to drastically reduce the size of the leaves. More on that in June. If you are tempted to try a tropical bonsai, I would suggest a Ficus to be your first attempt. I have a few tropicals in my den, under grow lights and on humidity trays, and really enjoy them during the cold, dreary days of winter.